– LUXURY REPORT EXPLAINED – The Institute for Luxury Home Marketing has analyzed a number of metrics — including sales prices, sales volumes, number of sales, sales-price-to-list-price ratios, days on market and price-per-square-foot – to provide you a comprehensive North American Luxury Market report. Additionally, we have further examined all of the individual luxury markets to provide both an overview and an in-depth analysis - including, where data is sufficient, a breakdown by luxury single-family homes and luxury attached homes. It is our intention to include additional luxury markets on a continual basis. If your market is not featured, please contact us so we can implement the necessary qualification process. 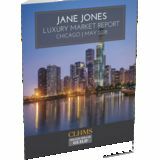 More in-depth reports on the luxury communities in your market are available as well. Looking through this report, you will notice three distinct market statuses, Buyer's Market, Seller's Market, and Balanced Market. A Buyer's Market indicates that buyers have greater control over the price point. This market type is demonstrated by a substantial number of homes on the market and few sales, suggesting demand for residential properties is slow for that market and/or price point. By contrast, a Seller's Market gives sellers greater control over the price point. Typically, this means there are few homes on the market and a generous demand, causing competition between buyers who ultimately drive sales prices higher. A Balanced Market indicates that neither the buyers nor the sellers control the price point at which that property will sell and that there is neither a glut nor a lack of inventory. Typically, this type of market sees a stabilization of both the list and sold price, the length of time the property is on the market as well as the expectancy amongst homeowners in their respective communities – so long as their home is priced in accordance with the current market value. REPORT GLOSSARY REMAINING INVENTORY: The total number of homes available at the close of a month. DAYS ON MARKET: Measures the number of days a home is available on the market before a purchase offer is accepted. LUXURY BENCHMARK PRICE: The price point that marks the transition from traditional homes to luxury homes. NEW LISTINGS: The number of homes that entered the market during the current month. PRICE PER SQUARE FOOT: Measures the dollar amount of the home's price for an individual square foot. SALES RATIO: Sales Ratio defines market speed and determines whether the market currently favors buyers or sellers. Buyer's Market = up to 14%; Balanced Market = 15 to 20%; Seller's Market = 21% plus. If >100%, sales from previous month exceed current inventory. SP/LP RATIO: The Sales Price/List Price Ratio compares the value of the sold price to the value of the list price. provides an in-depth look at the top residential markets across the United States and Canada. Within the individual markets, you will find established luxury benchmark prices and detailed survey of luxury active and sold properties designed to showcase current market status and recent trends. The national report illustrates a compilation of the top North American markets to review overall standards and trends. Copyright © 2019 Institute for Luxury Home Marketing | www.luxuryhomemarketing.com | 214.485.3000 The Luxury Market Report is a monthly analysis provided by The Institute for Luxury Home Marketing. Luxury benchmark prices are determined by The Institute annually. This active and sold data has been compiled by various sources, including local MLS boards, local tax records and Realtor.com. Data is deemed reliable to the best of our knowledge, but is not guaranteed. NORTH AMERICAN LUXURY REVIEW How Playing the Data Game Will Yield More Results in 2019 As we move into spring, which is traditionally the busiest time of year for home sales, and consider the statistical analysis illustrating that the overall high-end real estate market has normalized back to traditional levels, what does this mean to homeowners looking to sell? How in todayâ&#x20AC;&#x2122;s market can understanding statistics and working with the right real estate professional become the solution to meeting expectations? these expectations are likely to sell quickly, especially if their Realtor's marketing strategy positions it effectively in front of the right discerning buyers. This is critical in order to maximize the potential return on a luxury property; its exposure must go further than the local, or even national luxury real estate community! Choosing a Realtor who has an established local and global presence with both their peers and the affluent community might be the first step. The second step is to ensure your Realtor has a critical understanding of the nuances and influences that directly affect your home's value. But the key differentiator is an expert who understands how to analyze and use data to influence and find potential buyers - they will become your resource to a priceless solution! All data is based off median values. Median prices represent properties priced above respective city benchmark prices. Median SP/LP Ratio Total Sales Ratio Median Price per Sq. Ft. Median prices represent properties priced above respective city benchmark prices. Homes are selling for an average of 97.12% of list price. The median luxury threshold2 price is $1,000,000, and the median luxury home sales price is $1,425.000. Markets with the Highest Median Sales Price: Vail ($11,477,000), San Francisco ($3,650,000), LA - Beach Cities ($3,552,500), and Vancouver ($3,250,000). Markets with the Highest Sales Ratio: San Francisco (85%), Silicon Valley (48%), Seattle (44%), and Sacramento (34%). Sales Ratio defines market speed and market type: Buyer's = up to 14%; Balanced = 15 to 20%; Seller's = 21% plus. If >100%, sales from previous month exceeds current inventory. 2The luxury threshold price is set in December of each year by The Institute for Luxury Home Marketing. Median List Price Median Sale Price Median SP/LP Ratio Total Sales Ratio Median Price per Sq. Ft. Attached homes are selling for an average of 98.09% of list price. The median luxury threshold2 price is $693,725, and the median attached luxury sale price is $859,500. Markets with the Highest Median Sales Price: Vail ($3,900,000), San Francisco ($2,360,000), Marin County ($2,075,000), and Maui ($1,967,500). Markets with the Highest Sales Ratio: Arlington & Alexandria (67%), Silicon Valley (62%), LA - The Valley (51%), and Ventura County (49%). Markets with dashes do not have a significant luxury market for this report. Median prices represent properties priced above respective city benchmark prices. TORONTO MARKET SUMMARY | MARCH 2019 •	The Toronto single-family luxury market is a Buyer's Market with an 8% Sales Ratio. •	Homes sold for a median of 96.12% of list price in March 2019. •	The most active price band is $3,000,000-$3,249,999, where the sales ratio is 19%. •	The median luxury sales price for single-family homes has increased to $3,175,000. •	The median days on market for March 2019 was 23 days, up from 18 in February 2019. Square foot table does not account for listings and solds where square foot data is not disclosed. 4 Historical data before August 2017 does not account for listings taken off the market. 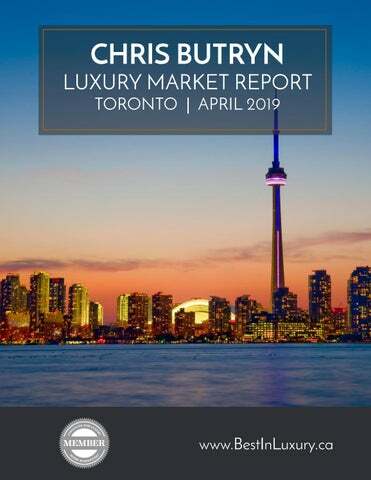 TORONTO MARKET SUMMARY | MARCH 2019 •	The Toronto attached luxury market is a Seller's Market with a 29% Sales Ratio. •	Homes sold for a median of 98.94% of list price in March 2019. •	The most active price band is $1,000,000-$1,049,999, where the sales ratio is 47%. •	The median luxury sales price for attached homes has decreased to $1,129,000. •	The median days on market for March 2019 was 13 days, down from 17 in February 2019. Not intended to solicit anyone already under contract. Information provided herein is believed to be true but not guaranteed. It is limited, and provided for information purposes only, on an â&#x20AC;&#x153;as isâ&#x20AC;? basis and without warranties of any kind, either express or implied, including but not limited to warranties of title or implied warranties of merchantability or fitness for a particular purpose, compatibility, accuracy or non-infringement. It is not, and should not be taken as consulting or other professional advice. You should not rely on, or take or fail to take any action based on this information. You assume full responsibility and risk of loss from your use of any information herein. Never disregard professional advice or delay in seeking it because of something you have read herein. To the fullest extent permitted by law, we make no warranties and shall not be liable for any use of the information under any circumstances, including, but not limited to, for our or our third party providersâ&#x20AC;&#x2122; negligence or errors. Subject to applicable laws, in no event shall we, nor any of our related entities, agents or licensors be responsible or liable for damages of any kind. Source for the statistics and information provided herein: The Institute for Luxury Home Marketing. Thank you for taking time to view this report. For more information about this report and the services I can offer you and your luxury property, please give me a call at 416.284.4751.